Tahqua Land Theatre of Newberry, Michigan is an incredible masterpiece of art. 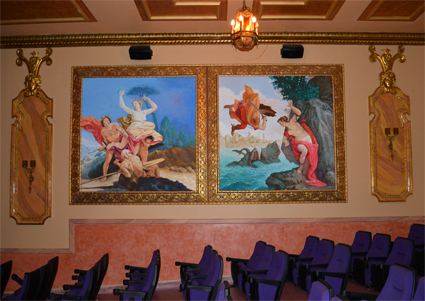 This Michigan Historical Theater has been restored in a Greek Mythological theme that echoes qualities only seen in Europe. Every detail was painstakingly met with the expertise of master artists and designers. 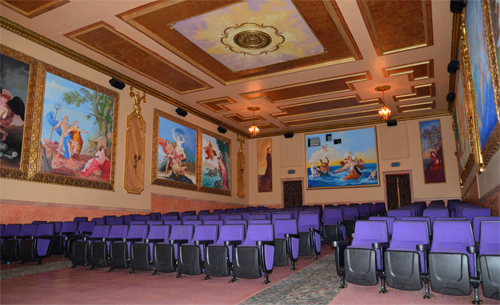 Real Italian Stucco, hand casted plaster moldings, over 10,000 sheets of Gold Leafing, and 11 large scale paintings / murals greet the patrons as they enter the movie theatre. The beauty of this Upper Peninsula Theater is truly a sight to see when traveling throughout Upper Michigan. Along with being a historical building, the art, walls, floors and ceilings are an amazing sight to behold. When you buy your ticket, you not only get to view the amazing decor and watch a great movie, you will also enjoy the comfort of our new theatre seating. Reclining seats make your movie going experience like no other. After our extensive renovations and our grand re-opening in 2001, the public has been amazed by the transformation and magnificence of the work of art that the entire property has become. We invite everyone of all ages to come and experience the Tahqua-Land Theatre of Newberry, MI, located in the heart of Michigan's Upper Peninsula. When visiting, treat yourself with a generous portion of popcorn, a variety of candies and fountain pop. This is certainly a must see attraction and historical stop when coming to the Tahquamenon River Valley area in Michigan's Upper Peninsula.